** Originally published in The Crabbet Influence July-August-September 1994 Abu Farwa Issue. 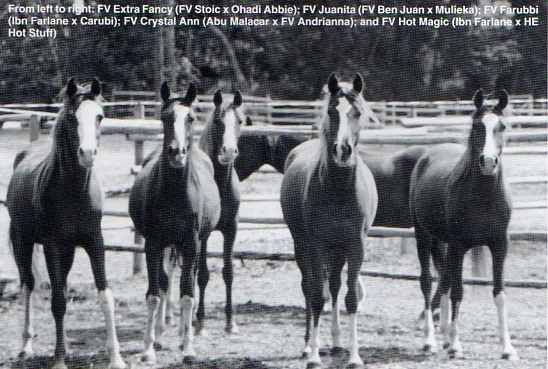 Fairview Farm youngsters: (left to right) FV Extra Fancy (FV Stoic x Ohadi Abbie), FV Juanita (FV Ben Juan x Mulieka), FV Farubbi (Ibn Farlane x Carubi), FV Crystal Ann (Abu Malacar x FV Andrianna), and FV Hot Magic (Ibn Farlane x HE Hot Stuff). The scenic Okanagan Valley of British Columbia is home to the finest peach and apple orchards in the province, a thriving tourism trade, and possibly the most concentrated Abu Farwa breeding program in the world. Dr. David Ward’s Fairview Farm is the home to a collection of over 50 linebred and inbred horses, based on the sons and daughters of the legendary Abu Farwa (Rabiyas x *Rissletta). For over 20 years, David has worked to keep the legacy of this great Kellogg stallion alive, preserving a gene pool that should prove invaluable for breeders in the future. Growing up in Oxbow, Saskatchewan, David started off with a grade chestnut mare that he bred to the Kellogg bred stallion, Rasalyf (Alyf x Rasyq). The result of this cross, a liver chestnut mare named Zombrera, is still at the family farm in Oxbow 25 years later. It was at about this same time that David would meet the man, and the horse, who still has an enormous impact at Fairview Farm today – long time Canadian breeder Hugh Cozart, and Farlane (Abu Farwa x Alleyna). 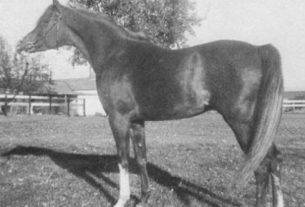 Through David’s friendship with Hugh, and their mutual love for Farlane, David was able to start acquiring foundation mares of Crabbet and Kellogg breeding that is still found in the pedigrees of his horses today. Farlane needs special mention,as he is truly David’s foundation stallion, with most of David’s horses having Farlane in their pedigrees. Sired by Abu Farwa, and out of the Alla Amarward daughter Alleyna, Farlane represents the best of early Kellogg/California breeding. He was a bright chestnut horse with high white stockings and a wide blaze, and enough white hairs on his sides to come close to being roan in coloring. Farlane possessed an exquisite head; short, with a small muzzle, and huge eyes, which he regularly passed on to his get. 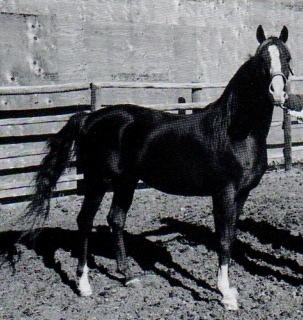 A well-shaped neck, short back, high tail carriage, and floating trot, were other Farlane traits that he had and regularly passed on to his offspring. 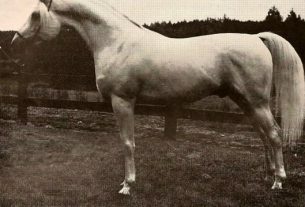 Upon the passing of Mr. Cozart in 1981, Farlane was placed on a lifetime lease to Fairview Farm, where he lived to the age of 31. There are many notable stallions represented in David’s breeding program. They include: Ab Salute (Abu Farwa x Numaana), the last foaled son of Abu Farwa and a dazzling young sire of race winners before his untimely death; Aur Patriot (Aurab x Alyna), one of the finest Aurab sons who was a top sire on Farlane daughters; and Muhuli (Abu Farwa x Follyanna), arguable Abu Farwa’s most look-alike son. 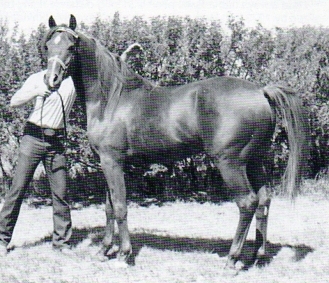 Though owned by Marjoria Van Gilder most of his life, Muhuli daughters play a major role in the Fairview breeding program. Two Farlane sons used at the farm today include Ibn Farlane (x Bea Teza) and Farlane’s Pride (x Mahalann), who are both siring good foals. Canadian Salute (Ab Salute x Allegra) is a double Abu Farwa grandson, and Kilauea Fire (Ga’Zi x Sanamali), an exotic chestnut, both stand at stud. GA Topaz (Galan by Abu Farwa x Aurtama), a frequent show winner at the CAHAO Show in Oregon is beginning his stud career after having been out on lease for several years. Ben Rabba is also represented at the farm through three sons, the most notable being Ohadi Ben Rabba (x Ohadi Miss Abbie), himself the head sire for the late Curtis Cox of Caldwell, Idaho (The Crabbet Influence April 1991 cover horse). There are two young Ibn Farlane sons also at the farm that David is very excited about using in the future. FV Orion Dream (x Nadira Dream by Farlane) and FV Sensational Farwa (x Ellora Farwa by Ab Salute) each represent several generations of Fairview breeding. Three recently acquired stallions of Crabbet breeding are being used as an outcross on the Abu Farwa mares. 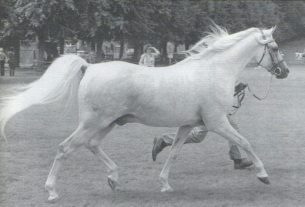 They are *Seyad (Silver Scimitar x Sa’Liliah) bred by the Archers in England, and two *Silver Vanity sons who are proven sires, Indian Silver++ (x *Taheki) and BL Majestical Gold (x Al-Marah Solo Mia). The most recent addition to the stallion roster is the royally bred Aya Matigua (Aurab x Abbie), who will be a new source of both Aurab and Abu Farwa blood. The list of broodmares at the farm is equally as impressive as the stallion roster. The mare band includes daughters of Farlane, Galan, Ab Salute, Ibn Farlane, Ben Rabba, Shaboud and Haat Shaat. Mares that are David’s particular favorites include; the Farlane daughters FV Andrriana (x Mouns Melody) and FV Premonition (x B. Rose of Ribal), FV Aurabba (Ben Rabba x Ferita Farwa), Mulieka (Muhuli x Bint Ghamil) on lease from Marjorie Van Gilder, and Ohadi Abbie (by Shaboud), a mare purchased at the Curtis Cox sale. Several mares of either straight Crabbet or predominately Crabbet breeding have been added over the last couple of years. *Nazeena (Ralvon Pilgrim x Nameesa) along with two of her *Ralvon Elijah daughters are at the farm. Also in residence is the majority of the Ber Len broodmare band, including direct daughters of *Serafix, *Silver Vanity and *Touch of Magic. The “new” Crabbet mares are being bred to the linebred Abu Farwa stallions with spectacular results. With the extensive amount of breeding that is done at the farm every year, David has little time left for showing, preferring instead to sell younger stock to show, race and endurance homes. 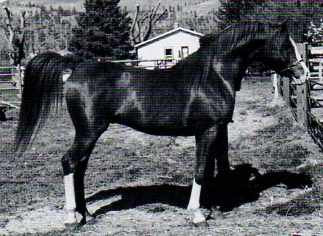 An exception to this is Farlane’s Pride+/, who has his Legion of Honor, with Canadian National Top Ten awards in performance, and several Region XVII championships. On the track, many of the Farlane and Ab Salute get have raced, with the most notable being Amal Salute (Ab Salute x Muferra), Reserve Race Horse of the Year in Canada. 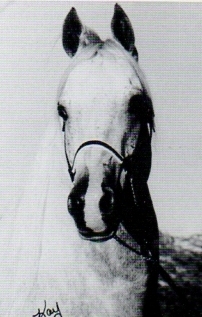 David’s mare, Muferra, is also the dam of the first horse inducted into the Endurance Riding Hall of Fame, RT Muffin. With this type of show and race results, it is obvious that Fairview horses are not only bred for beauty, but also to be powerful and sound athletes. The 1994 crop of foals will bring 14 more future champions of classic Crabbet/Kellogg breeding to the farm, some of which will made available to fellow breeders. The friendships that David has made along the way are treasured as much as the horses that inspired them. Lois Russell, Janet Oddy, Dr. and Mrs. West and Joy Pritchard are all people who have shared their knowledge and friendship with David. Marjorie Van Gilder has been an inspiration and almost a second ‘mother’ to him over the last 20 years. “I only have a couple of regrets about the horses,” remarked David, “the first, that I never had the chance to see Abu Farwa in person, and the second, that Ab Salute died at such a young age (12 years).” Other than those two things, David would do little to change the breed, although he would like to see more new people become involved who are horsemen and true breeders. When not busy with the horses, which is most of the time, David and his partner Bill Lewis have very busy careers. David is a veterinarian with Agriculture Canada and Bill is a career employee with Canadian Airlines. When they have free time, Bill and David golf, garden and go boating on Skaha Lake, where their home is located. What’s in the future for David and Fairview Farm? To keep on breeding quality CMK horses with classic beauty, athletic conformation and good minds, which are all part of the Abu Farwa legacy.